50Watt DC/DC 24VDC to 5V 10A isolated converter module. DC/DC converters. 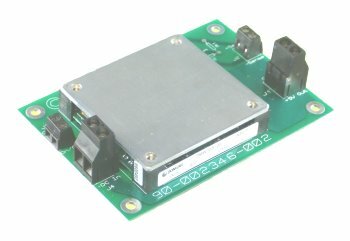 Isolated DC converter brick module. To use the remote sense, connect the "Sense +" and "Sense -" terminals to wires that go to the load and don't carry any current. This lets the DC converter stabilize the voltage at the load, compensating for voltage loss in the wires that carry current. Schematic of how to trim the output voltage. 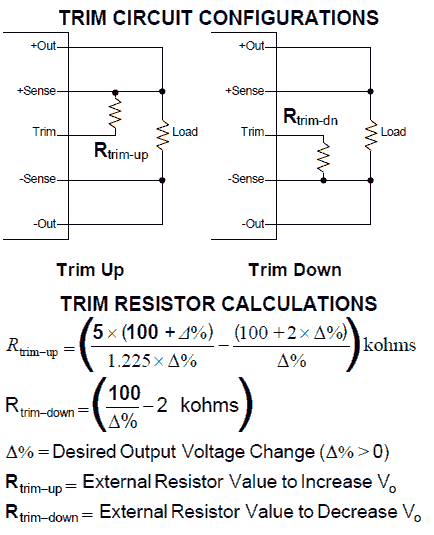 Fixed resistors would also work, they should add to about 10k Ohms. No heat sink is necessary at ambient temperatures below 30°C. At higher ambient temperatures derate the current or supply a flow of up to 200LFM (linear feet per minute) cooling air is provided (at 100°C ambient). This can be supplied by a 10 cubic feet per minute fan that is about 2.5 inches square. Pentium cooling heat-sink-fans will also do this. Standard heatsinks are available for half-brick modules such as Wakefield 517-95AB, 527-45AB, 527-24AB, 518-95AB, 528-45AB, 528-24AB, or the less expensive CUI VHS-45 or VHS-95. NOTE! At maximum power the faceplate temperatures are definitely in the "burn your fingers" category and care should be taken to prevent human contact.